What a cheerful presentation! Smiley Face Daisies spell out "Get Well Soon"! Wrapped in crisp clear cellophane and topped off with a printed smiley face cellophane fan and a handmade bow. Includes a handwritten greeting card. Add balloons or plush animals. Large: Individual foil wrapped Tea Bags, Ghirardelli Milk Chocolate Squares, "Get Well Soon" Snack Mix, four (4) Grandma's Cookie packages (8 cookies), bottle of Snapple Juice or Tea, Sorrento Cocoa or Mocha, box of Nuts, Pretzel Twists (Salted Caramel or Smoky Barbecue), Popcorn (Almond Pecan Crunch, Dark Chocolate with Sea Salt, Cranberry Walnut Crunch, or Cheddar & Caramel Crunch), and a box of Peanut Brittle...all for the patient and for sharing with loved ones. The container is from a Texas company along with the Snack Mix. 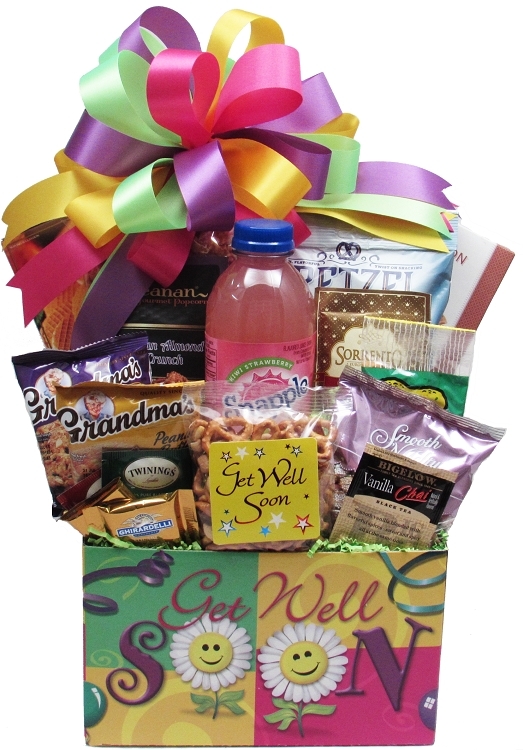 The Cookies, Juice/Tea, Nuts, and Popcorn, are from Local Dallas Area Companies! 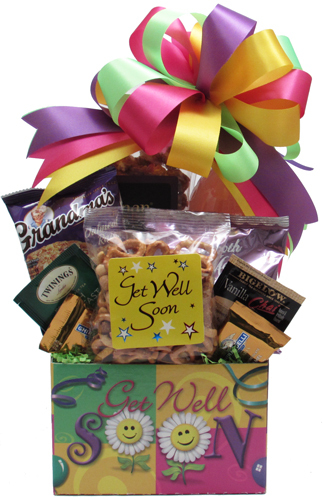 Finished wrapped basket for hand delivery is approximately 19"H x 12"L x 8"W.
Small: "Get Well" Snack Mix, Ghirardelli Chocolate Squares, Individually Wrapped Tea Bags, Grandma's Cookies, Nuts, bottle of Snapple Juice or Tea, gourmet Popcorn. Finished wrapped design for hand delivery is approximately 15"H x 9"L x 6"W.
*For shipments - Due to dimensional weight freight rates, we design with the products lower in the container with a different style bow. The Smooth & Melty Mints in the photo, have been replaced with other items.